Finally! A pumpkin cookie with the perfect texture. Crispy edges, soft and chewy centers, and plenty of gooey cinnamon chips. Bake these today!!! One recipe I was determined to nail this Fall? Pumpkin cookies. But not just any pumpkin cookie. I wanted to create my dream pumpkin cookie. So what’s a dream pumpkin cookie taste like? I’m glad ya asked! In other words. 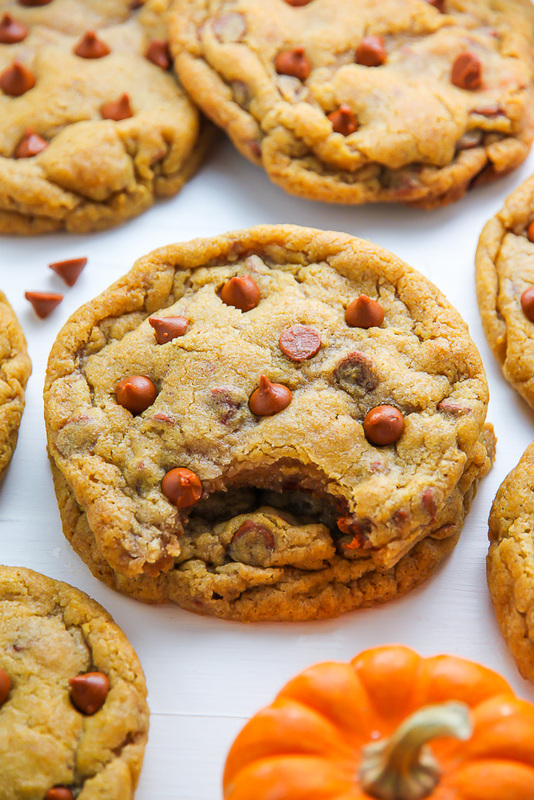 These cookies are pure, pumpkin magic. I created this recipe for fellow pumpkin lovers who crave a cookie full of pumpkin flavor, but still have the texture of an actual cookie. I cannot tell you how many pumpkin cookie recipes I’ve tried that promise a chewy cookie… but deliver a cake-y, almost muffin like one. Don’t get me wrong, I love muffins! But not when I want a cookie. So let’s get down to details. How did I make these cookies so awesome?! Well, actually, it’s pretty simple. First up, let’s talk ingredients. For this recipe you’ll need butter, sugar (granulated and brown), vanilla, pumpkin puree (NOT pumpkin pie mix), pumpkin pie spice, all-purpose flour, baking soda, salt, and cinnamon chips. SPEAKING OF CINNAMON CHIPS ↓↓↓ Cinnamon Chips are my secret ingredient for making these cookies 110% addicting. I used these Hershey’s Cinnamon Baking Chips , but feel free to use any brand you like. Making these cookies is so so simple. All you need to do is whisk up the dough. Roll it. Bake it. Eat it!!! Hallelujah, this recipe requires NO chill time. ← Can we just pause for a moment and appreciate that awesomeness?! Thick, chewy, dotted with cinnamon chips, and loaded with real pumpkin flavor in every bite. These cookies are the real deal. In a medium-sized bowl whisk together the flour, baking soda, pumpkin spice, and salt; set aside. In a large bowl using a handheld mixer or in the bowl of a stand mixer fitted with the paddle attachment, beat the butter until smooth - about 1 minute. Add in the sugars and vanilla and beat on medium-speed until light and fluffy; about 2 minutes. Add the pumpkin puree and beat until it's just combined, about 45 seconds. Gently fold in the flour mixture with a rubber spatula, stirring only until the flour begins to disappear. Fold in cinnamon chips. Roll 3 tablespoon-sized balls of dough between your palms to form a ball (they should be big; almost a 1/4 cup), then place on prepared sheet (make sure to leave enough room in between each cookie for inevitable spreading). Continue this process until all the dough has been rolled. Place baking sheets in preheated oven and bake for 15-16 minutes, or until golden at the edges and set in the middle. 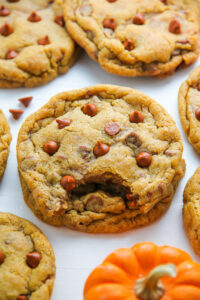 Allow cookies to cool for 30 minutes on the baking sheet before transferring them to a wire wrack to cool completely. Chewy cookies with cinnamon bits.. they look just amazing! I made these delicious cookies and my family absolutely loved them! My daughter who is an avid baker could not guess what the secret ingredient was. Thank you for posting such a delicious recipe, I’ve never impressed my family so much! 15 tablespoons of butter??? Must be mistake?? Hi Jackie. No mistake; that is the correct amount. Are these chips seasonal? I have been to 2 large stores and neither one has them. Hi Judy. I’ve never had a problem finding them year round, but you can also order them online if need be. I shop at Stop and Shop and Giant and they usually have them in baking aisle 😉 Hope that helps! Where do you find pumpkin puree? I have never used that before. Would really like to try this recipe! Always looking for good cookie recipes. These are wonderful! Baked up exactly as you described. I was looking for something new and will definitely keep your recipe! Thank you! 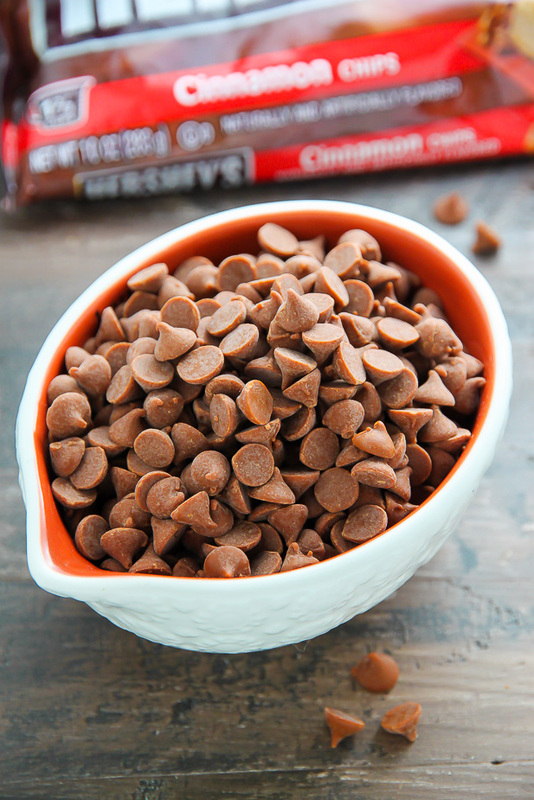 Have you tried making these with chocolate chips instead of cinnamon chips? Hi Erica. I haven’t, but I think it would work great! I have. They are very good, but I prefer this recipe with the cinnamon chips. I felt like the chocolate chips overwhelmed the pumpkin a little, but my husband loves chocolate so he preferred the chocolate chips. The recipe doesn’t call for eggs….is this a Mis-print? Wondering about the no eggs? Hi Tina. There are no eggs in this recipe. OMG, these cookies are amazing! 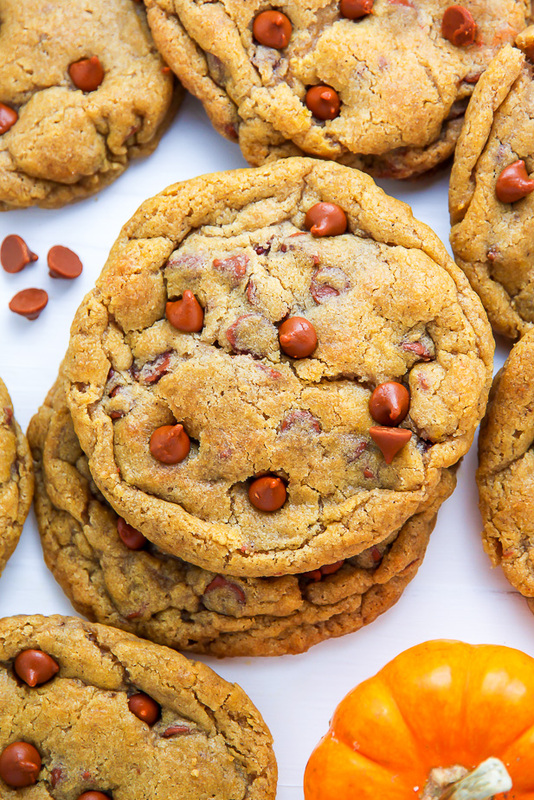 Love the flavor of the pumpkin with the cinnamon chips! This is an amazing recipe! Thank you so much for sharing!! So happy you enjoyed it Cathy! I had half a can of pumpkm in the fridge waiting to be used up–these just came out of the oven and are delicious! Thanks for sharing! Ashley, I cannot wait to make these!! Thank you so much for putting nutrition info with the recipe!!!! do you know what 15 Tbsps equals in cups? I have a brain injury and counting and remembering is a challenge!! It’s one tablespoon less than a cup. Hi Stacie! Yes – 15 tablespoons is correct 🙂 How did they turn out? Hi and thanks so much for this delicious recipe! I want to try it out tomorrow and since I am from Germany I am not familiar with tablespoons as measurement size. One Tablespoon makes about 30 grams.. Would this be the correct way of calculation? Since we don’t have cinnamon chips here I will go with normal chocolate chips. Would you recommend to add about a tablespoon cinnamon to the cookies then? Can the dough be made in advance and Put in the refrigerator until ready to bake? Like 24 hours? The cookies were WONDERFUL! I took them to work and church, and everyone raved about them. I couldn’t find cinnamon chips so I used salted caramel. They turned out amazing!! These cookies are fabulous! I took them to work and my friend asked if I would make them for her daughter’s reception. BTW – Target carries cinnamon chips in their seasonal section during the fall, but I could swear I bought some by the regular chips last spring. just wondering did you use salted or unsalted butter? Hi Robin. I use unsalted butter, but salted can be used. Simply omit the salt called for in the recipe! OH MY! Just made these and I have to say they are AMAZING! So so yummy! Followed the recipe and they came out perfect. 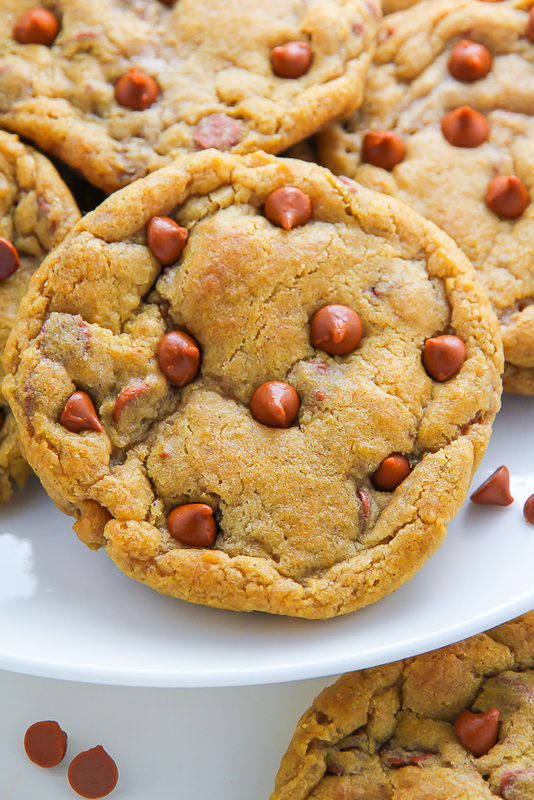 I have made these cookies numerous times and everyone absolutely loves them. One time I had started them before I realized I didn’t have any pumpkin. I substituted two eggs for the pumpkin and added 1/2 teaspoon baking powder and they were also delicious.